Go for classic style with a twist with this attractive ladies' watch from Limit. Featuring an elegant beige coloured dial set with white hour number, this pretty watch has a silver toned case and is finished with a matching beige strap for a timeless look. 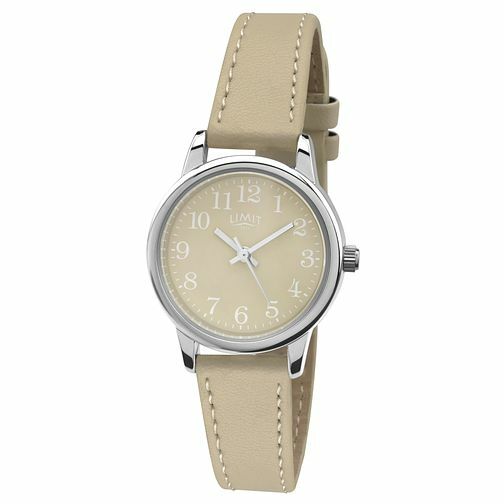 Limit Ladies' Silver Tone & Beige Strap Watch is rated 4.5 out of 5 by 2. Rated 5 out of 5 by Anonymous from Neat watch for holidays I like to take a cheaper watch on holiday and I'm very pleased with this one. I like the colour of the strap and watch face - think it looks quite smart. Rated 4 out of 5 by Anonymous from Chaep watch with good quality I bought this watch for everyday use. Its a cheap one and really good for this price. I have been using it since 2 to 3 weeks from now and working fine plus looks decent on wrist. I Would recommend this.